Present state: Station building in residential use and in an excellent state of preservation, Grade II listed. Platforms demolished. Cattle dock is overgrown.. The railway between Newcastle and Berwick was conceived primarily as a route for freight and long-distance passenger traffic, therefore providing a convenient service to intermediate settlements in the sparsely populated Northumbrian countryside was not a priority. The substantial village of Warkworth was left about 1½ miles from the railway, but it was given a well-designed station of generous size. The layout of the station was at first the conventional one for Newcastle & Berwick stations, with two facing platforms. The main building is on the up side, presenting a two-storey structure to the railway. Like the other 1847 stations it is of squared sandstone with quoins and a Welsh slate roof. The Gothic ‘Jacobethan’ design has an H-plan, the cross-wings clasping a verandah, with gabled half-dormers above. The southern cross-wing has canted bay windows on both floors. Single-storey wings extend to the south and north-east. The eastern elevation is of two-storeys above a tall basement, the most prominent feature being a flight of 17 steps up to a portico tucked into a gable with diagonal buttresses and three pointed arches. The gables end with kneelers, and many of the gables and kneelers retain their decorative ball finials. The chimneystacks are stepped and corniced, with diagonally-set multiple shafts, on the ridges and some of the gables. The porter’s wing of the building has its ground floor at the level of the station basement and Fawcett (2011) considers this ‘a very effective visual buttress to the composition’. The building was given Grade II listing in September 1988. A stone building with a pitched roof, its appearance complementing the main building, stood towards the southern end of the up platform. It resembled the position and character of the goods shed at Longhoughton station (north of Alnmouth) and is assumed to have been intended for this role. However at Warkworth the goods shed was located north of the up platform (as noted below) but the structure assumed to have been intended as the goods shed adjoined the coal depot; presumably it was used in connection with coal traffic. A waiting shed of substantial length was provided on the facing, down platform. It was porobably of the standard stone-built pent-roof type. No photographs of drawings have been seen to confirm this. OS map evidence reveals that by 1897 the location of the down platform had changed. This was probably made necessary to accommodate a longer siding to lead to the cattle dock. The new platform was displaced northward of the up platform, and this ‘staggered’ layout enabled a barrow crossing to connect the northern ramp of the up platform with the southern ramp of the down platform. A subway between the platforms was also provided, but the date of its construction is not known. It was not shown on OS maps until the 1960 edition of the 1: 2,500 sheet. The new platform was provided with a waiting shelter. Two sidings served the coal depot immediately south of the up side passenger facilities while the goods shed was to the north, also on the up side. Two sidings on the down side, south of the passenger platform, served the cattle dock. As noted above, by 1897 a long siding for access to the cattle dock had been installed occupying the position of the original down platform, which had been rebuilt north of its original position. The 1904 RCH Handbook notes that a full range of goods traffic could be handled and the crane had 3 ton capacity; the handbook also referred to Shortridge Farm Siding close to the station. By 1873 a brick signal box was built immediately south of the level crossing on the up side, but sometime before 1923 a new box was constructed on the down side, again immediately south of the level crossing. In May 1849 Reid’s Monthly Time Table shows three train departures to Newcastle, at 8.42am and 12.12 and 6.54pm on weekdays, with Sunday departures at 8.30am and 6.46pm. Trains for Berwick left at 8.18am and at 2.53, 5.05 and 8.08pm, with Sunday departures at 8.31am and 7.28pm. At that time the limited stop services between Newcastle and Berwick usually called at Morpeth, Acklington, Lesbury (for Alnwick) and Belford, with some also stopping at Tweedmouth. Bradshaw of February 1863 shows a service of similar frequency, but with one extra southbound departure on weekdays. 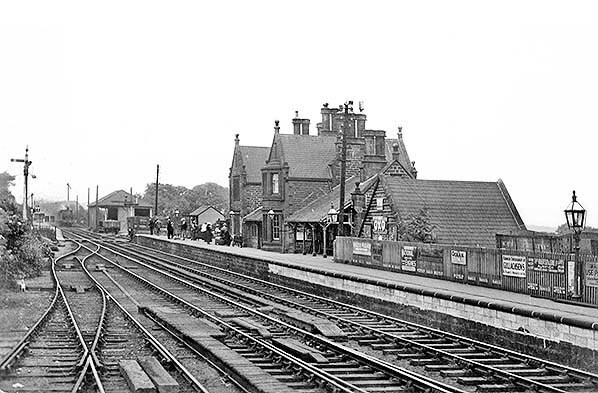 Warkworth was one of the ten main line stations in Northumberland which closed to passengers on 15 September 1958. Goods facilities were retained until 2 April 1962. 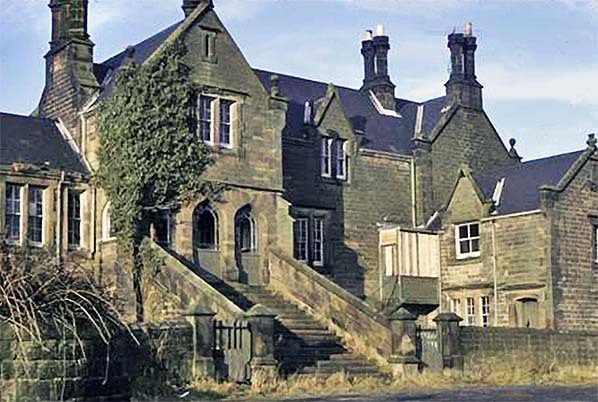 The platforms and waiting shelter were demolished soon after closure, but the main building is in residential use. In January 1964 the signal box was relegated to a gate box, and it closed in December 1967 when automatic half-barriers were installed, and was subsequently dismantled. From December 1990 the crossing was supervised from Alnmouth by CCTV. Two lengthy mineral branches extended west from the main line close to Warkworth, and they outlived the station. One-and-a-half miles north of Warkworth a branch left to serve Shilbottle Colliery. Rail traffic ceased early in 1978 and the colliery closed in 1982; the rails were lifted by the mid 1980s. One mile south of Warkworth a branch served Whittle Colliery, and this line closed with the colliery in 1987. Warkworth station looking north from the cattle sidings c1905. As originally built, the down platform was in the position where the photographer is standing, but by 1897 a new platform had been built further north. The grand station building is seen on the up platform. It is one variation of the sandstone Gothic ‘Jacobethan’ buildings designed by Benjamin Green for the Newcastle & Berwick Railway for its opening in 1847. This was one of the most elaborate stations, with two storeys facing the platform, carried on a tall basement. The two projecting gables, one with bay windows on both storeys, clasped a verandah, and a further verandah fronted the southern single-storey wing. Raised gables and small parapets at each end were embellished with stone ball finials, and tall chimneystacks towered above the roof. The lower stone building with a pitched roof and an ‘Oxo’ advertisement was possibly intended to be a goods shed. The coal depot is on the extreme right. The abundance of enamel advertising signs was a common feature of early twentieth century stations. The goods shed and sidings are seen in the background (right). 1864-1895 1: 2,500 OS map. Warkworth station is seen in its rural seclusion, with only Hound Dean Mill conveniently served; Warkworth village is about 1¼ miles further east, along the lane. Almost all of the station’s structures are on the up (east) platform, with only a waiting shed on the facing down platform. By the end of the nineteenth century the down platform would be relocated to the north of its original position. On the up side north of the station a siding, with a headshunt, enters the goods shed (not identified by name). The coal depot is south of the station building. The cattle dock adjoins the level crossing on the down side, and it is reached by two sidings, and a headshunt approaches the ramp of the down platform. 1897 1:2,500 OS map. The down (west) platform has been reconstructed north of its former position. A long siding leading to the cattle dock occupies the site of the old platform.A signal box has been constructed on the south side of the level crossing, east of the tracks. A siding continues north of the goods shed to re-join the man line, and it has a headshunt. North-east of the station several railway cottages are shown, but not named. In the freight facilities south of the passenger station a weighing machine (WM) and crane are shown. 1960 1: 2,500 OS map. The station has now closed to passengers but would remain open for goods traffic until 1962. The original signal box has been replaced with a new one on the west side of the tracks, again immediately south of the level crossing. The subway linking the up and down platforms is named and so are the ramps at the southern end of the down platform and the cattle dock; for no apparent reason the down platform’s northern ramp and both those on the up platform are not named. 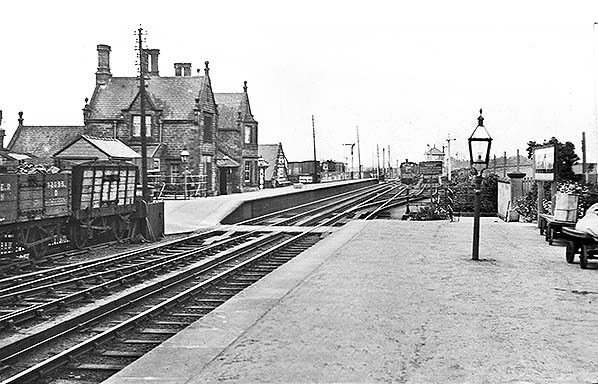 Warkworth station looking south from the down platform c1910. The oil lantern and running-in nameboard, both of NER design, are in the foreground. The main passenger facilities are on the up platform, reached from the down platform by a subway and barrow crossing. The dignified main building displays all the hallmarks of Benjamin Green’s designs for the N&B stations which opened in 1847: the Gothic ‘Jacobethan’ sandstone structure boasts bay windows, raised gables, ball finials and tall chimneystacks. The siding directly ahead serves the cattle dock and occupies the original position of the down platform. Beyond, in the distance, the hipped roof of the signal box can be seen. This was the second signal box at the level crossing, having replaced one on the opposite side of the tracks. In this 1950s or early 1960s view facing south, A4 Pacific ‘Dominion of Canada’ is standing on the up line at Warkworth level crossing. The station is behind the photographer. 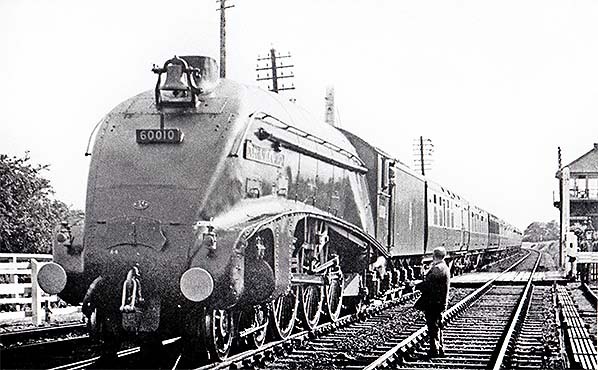 The Gresley-designed 4-6-2 loco was built by the LNER at its Doncaster works in May 1937. 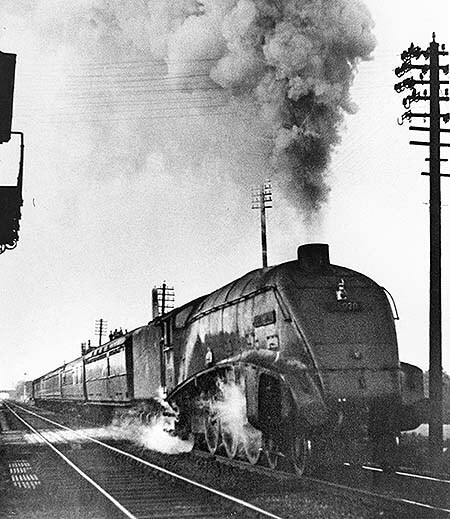 Initially carrying the number 4489, and later 10, under BR in October 1948 the loco was renumbered 60010. The loco was withdrawn from 61B, Aberdeen Ferryhill shed, on 29 May 1965, and was shipped to Canada to be preserved in the Canadian Railway Museum, Quebec. In 2012 she returned to the UK to be displayed at Shildon and at the National Railway Museum, York, but is now in Canada once more. The road frontage of Warkworth station is seen, looking north-west in December 1965. The staircase leads upward to the portico on the ground floor of the main station building at platform level. The porter’s wing, to the right, is at ground level adjoining the basement of the main building. In December 1970 Warkworth station building is seen, looking north from an up (southbound) train. The platform has been demolished, but the stately building is in good order, though soot-blackened. 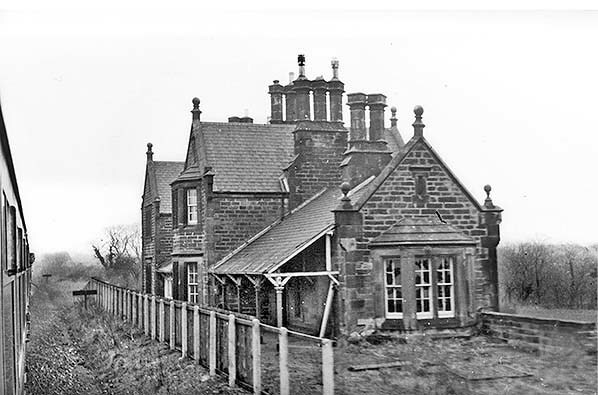 The canted bay at the near end of the single-storey wing is understood to have lit the waiting room which was initially provided for the Duke of Northumberland, which he presumably used before the suitably grand station at Alnwick – close to his seat at Alnwick Castle – was provided in 1887. The roof of the single-storey section is carried forward to form the southern verandah, supported by a series of columns. The roofline of the building is enlivened by tall chimneystacks and numerous ball finials.